This is a low growing penstemon with narrow, linear leaves and profuse blooms that start out blue and turn rose-purple. It gets to about 2' high and 2' wide and flowers from spring through the summer. It is highly desirable in the garden for its long-flowering and colorful blooms and is tolerant of a wide range of garden conditions. This flower works well in many situations; planted in masses on a bank, as part of a border, or in a rock garden. 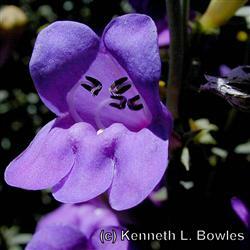 Penstemon 'Margarita BOP' was first discovered as a chance seedling by Bert Wilson of Las Pilitas Nursery.